All rooms have an ocean view. We promise quality delicacies and great hospitality. 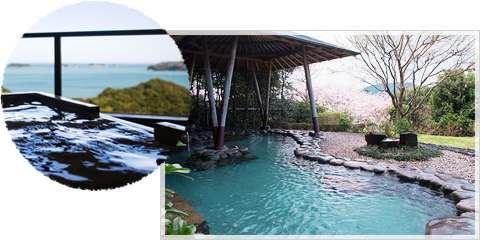 The blue ocean, the scent of the wind, the taste of Ise-Shima, and a beautiful ryokan with exquisite furniture, designed to be one rank up from others, await you. And above all, the Japanese spirit of omotenashi will make you feel right at home. Umi-no-Chou has good access from major cities such as Tokyo and Osaka, and there are many sightseeing spots in the area. There are various sightseeing spots around Umi-no-Chou. Many people visit Ise Jingu from all over Japan. Umi-no-Chou is conveniently located just a 20-minute drive from Ise Jingu. Tourists are drawn by the attraction of experiencing a unique atmosphere once they set foot inside the precincts. At Okage Yokocho, which is in Oharai-machi on the way to Ise Jingu, various specialties including Akafuku (Japanese confectionary) and fresh seafood are sold, and you can munch on them as you walk around the streets. Besides Ise Jingu, there are other tourist attractions unique to Ise, like Shima Spain Village, Toba Aquarium and Ise Azuchimomoyama Bunkamura. 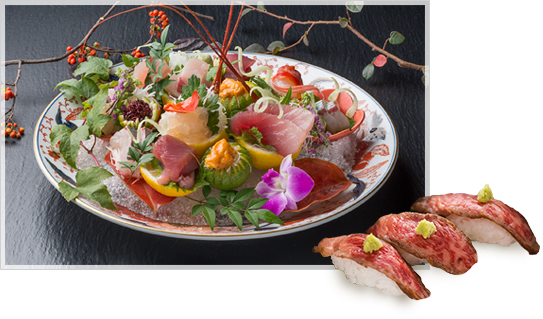 We are waiting to welcome you to Umi-no-Chou with heartfelt hospitality. The philosophy of Umi-no-Chou's chef is to "serve local ingredients at their best." Please enjoy the chef's specialties to your heart's content. all with an ocean view. The grand panorama of Ise-Shima can be enjoyed from any room. There are various types of room, including western-style rooms with tatami and rooms with open-air baths. Because Umi-no-Chou is located on the Toba plateau, all day long you can enjoy the spectacle of the magnificent Ise Bay, floating islands and scenery which changes with the hour. Relax mind and body with the wide, open view and warm water smooth to the skin. Here, we introduce photos showing the some of the features of Umi-no-Chou. Please take a look! There are many photos that can only be seen here, including photos of the surrounding scenery, inside the building, the food and the guest rooms. Quality delicacies and great hospitality.